1. McGinnis JM, Gootman JA, Kraak VI. Food Marketing to Children and Youth: Threat or Opportunity? Executive Summary. 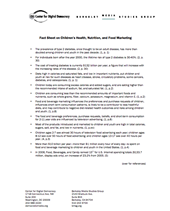 IOM Committee on Food Marketing and the Diets of Children and Youth, 2006. 2. Stallings VA, Yaktine AL. Nutrition Standards for Foods in Schools: Leading the Way Toward Healthier Youth. IOM Committee on Nutrition Standards for Foods in Schools, 2007. 3. Williams DE, Cadwell BL, Cheng YJ, et al. Prevalence of Impaired Fasting Glucose and Its Relationship With Cardiovascular Disease Risk Factors in US Adolescents, 1999-2000. Pediatrics 2005. 116(5):1122-1126. 4. The Henry J. Kaiser Family Foundation. Food for Thought: Television Food Advertising to Children in the United States. A Kaiser Family Foundation Report, March 2007. 5. Digital Marketing & Media Fact Pact, a supplement to Advertising Age, April 23, 2007.